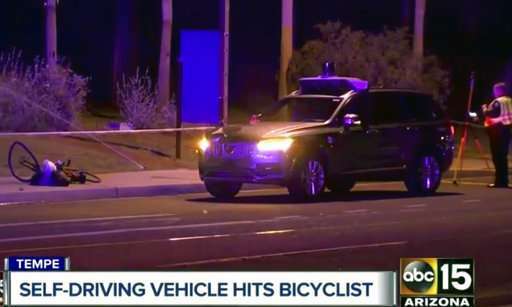 A self-driving Uber SUV struck and killed a pedestrian in suburban Phoenix in the first death involving a fully autonomous test vehicle—a crash that could have far-reaching consequences for the new technology. The fatality Sunday night in Tempe was the event many in the auto and technology industries were dreading but knew was inevitable. 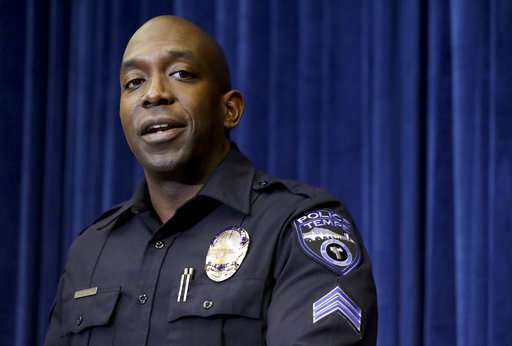 Tempe police Sgt. Ronald Elcock said local authorities haven't drawn any conclusions about who is at fault but urged people to use crosswalks. He told reporters at a news conference Monday the Uber vehicle was traveling around 40 mph when it hit Helzberg immediately as she stepped on to the street. Neither she nor the backup driver showed signs of impairment, he said. 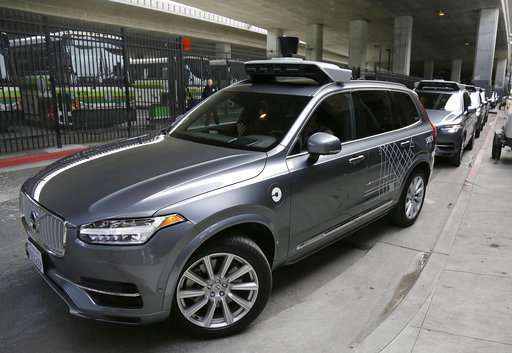 The public's image of the vehicles will be defined by stories like the crash in Tempe, said Bryant Walker Smith, a University of South Carolina law professor who studies self-driving vehicles. 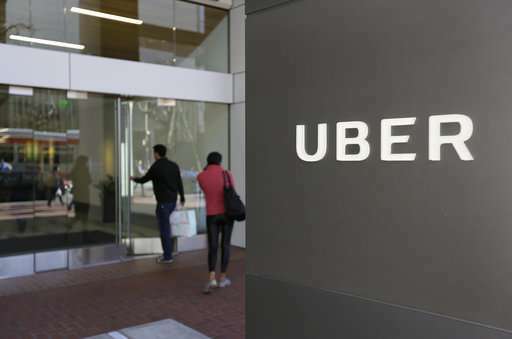 Although the Uber vehicle and its human backup could be at fault, it may turn out that there was nothing either could have done to stop the crash, he said. 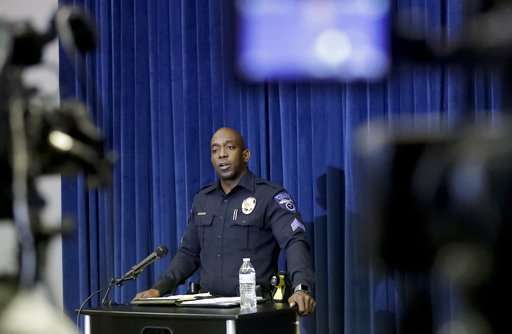 Either way, the fatality could hurt the technology's image and lead to a push for more regulations at the state and federal levels, Smith said. Autonomous vehicles with laser, radar and camera sensors and sophisticated computers have been billed as the way to reduce the more than 40,000 traffic deaths a year in the U.S. alone. Ninety-four percent of crashes are caused by human error, the government says. Autonomous vehicles don't drive drunk, don't get sleepy and aren't easily distracted. But they do have faults. 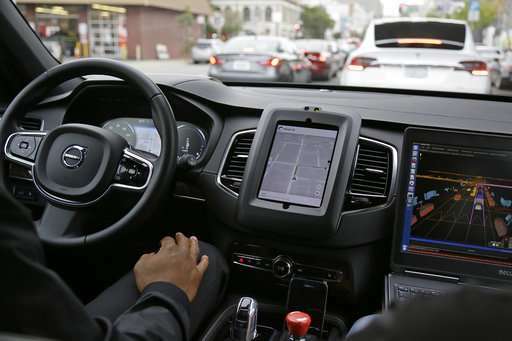 "We should be concerned about automated driving," Smith said. "We should be terrified about human driving." In 2016, the latest year available, more than 6,000 U.S. pedestrians were killed by vehicles. The federal government has voluntary guidelines for companies that want to test autonomous vehicles, leaving much of the regulation up to states. Many states, including Michigan and Arizona, have taken a largely hands-off approach, hoping to gain jobs from the new technology, while California and others have taken a harder line. California is among states that require manufacturers to report any incidents during the testing phase. As of early March, the state's motor vehicle agency had received 59 such reports. Arizona Gov. Doug Ducey used light regulations to entice Uber to the state after the company had a shaky rollout of test cars in San Francisco. Arizona has no reporting requirements. 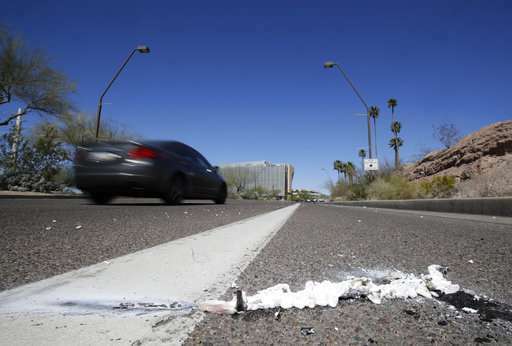 Hundreds of vehicles with automated driving systems have been on Arizona's roads. Ducey's office expressed sympathy for Herzberg's family and said safety is the top priority. The crash in Arizona isn't the first involving an Uber autonomous test vehicle. In March 2017, an Uber SUV flipped onto its side, also in Tempe. No serious injuries were reported, and the driver of the other car was cited for a violation. Herzberg's death is the first involving an autonomous test vehicle but not the first in a car with some self-driving features. The driver of a Tesla Model S was killed in 2016 when his car, operating on its Autopilot system, crashed into a tractor-trailer in Florida. The NTSB said that driver inattention was to blame but that design limitations with the system played a major role in the crash. The U.S. Transportation Department is considering further voluntary guidelines that it says would help foster innovation. Proposals also are pending in Congress, including one that would stop states from regulating autonomous vehicles, Smith said. Peter Kurdock, director of regulatory affairs for Advocates for Highway and Auto Safety in Washington, said the group sent a letter Monday to Transportation Secretary Elaine Chao saying it is concerned about a lack of action and oversight by the department as autonomous vehicles are developed. That letter was planned before the crash. Kurdock said the deadly crash should serve as a "startling reminder" to members of Congress that they need to "think through all the issues to put together the best bill they can to hopefully prevent more of these tragedies from occurring." What is the ratio of autonomous vehicular deaths per vehicle hour compared to regular vehicle deaths per hour. By taking these vehicles off the road(and being politically correct) they will be indirectly causing a great many more vehicular deaths. Very simple solution: the executive who approved this vehicle test is held liable for vehicular manslaughter; all testing will grind to a halt. Iochroma, I agree with you! I am 71 and will drive till I am 90+, even though even now I am not a good driver. I just hope I don't kill any of your kids or loved ones because you chose me over a computer. Rderkis is right; if you compare this ONE fatality with that of the thousands of fatal car crashes all over the world every single day caused by human drivers, it would be nonsensical to pull this technology. Most of the lethal car crashes today would actually be prevented if they were all replaced with autonomous cars. I just wonder how the interaction would work out when in the future different companies using different algorithms to compute their version of probabilistic risk were to interact on the road. From the preliminary description of the accident, the pedestrian stepped in front of the moving car. In this case it seems like a human driver would have hit her too, especially since it was outside of a crosswalk. The investigation has just begun, but the luddites are already blaming technology for an accident that probably was unavoidable after the pedestrian stepped onto the road. The only answer to this tragedy is a full ban on assault cars. Only prohibition can solve this problem. Who are these pathetic losers who can't drive their own cars, are they scared? quote cantdrive85 "Who are these pathetic losers who can't drive their own cars, are they scared?" Such compassion and understanding for the disabled! With that level of understanding you must be a 10 year old. It takes no bravery putting someone else's life at risk. Your sarcasm detector must be broken. OK I just saw the video of the accident. It looks to me that the headlights were pointed WAY too low towards the ground and that the cutoff of the beams was so sharp that it would be impossible to see far enough in front of the car at night to avoid any sort of accident. I have a widescreen monitor in my cars, it's called a windshield and I believe this has been standard hardware since the Model T.
Experts: https://apnews.co...ed-woman (Video of accident at link). The experts are unsure if the test vehicle was equipped with a video monitor that the backup driver may have been viewing. All this talk of fault is silly. Of course it is the vehicle's fault. A autonomous car should be able to avoid ALL accidents. When they are perfected, a person should not be able to even intentionally jump in front of one. That time will come but even now they are safer than most human drivers and they will keep getting better at a terrific pace. In the backup driver's defense it must be very hard to be 100% attentive if you are not the one actually driving the car. Yea I know that it was his job but your mind can easily wander when you are just a paid observer and not the person actually performing the action. When I look at the road at night I always assumed that I could see a person standing at the leading edge of my headlights. Well as this video shows due to the focusing of the light beam you might be able to see their shoes but by the time their full body is illuminated you will have way less than one second to react. When I look at the road at night I always assumed that I could see a person standing at the leading edge of my headlights. Everyone here is assuming the car uses the same light spectrum a human uses. My infrared security cameras can almost see in the dark. I don't know but I am guessing those cars can do kind of the same thing (Besides using the spectrum we use). I wish they would show us what the car saw converted to our spectrum of course. Rderkis what a great point. Since you do not have to worry about blinding oncoming drivers they could make the IR headlights as bright as they want and dim them when another autonomous vehicle is in range. They could also aim them higher to see farther.